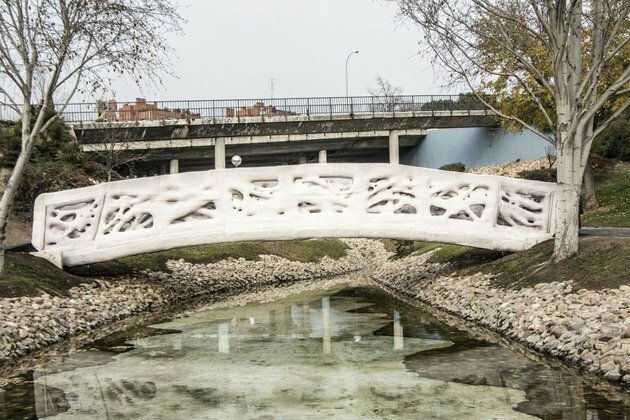 NEWS: This bridge was 3D Printed! 3D printing - only good for making tiny bits of plastic objects, right? 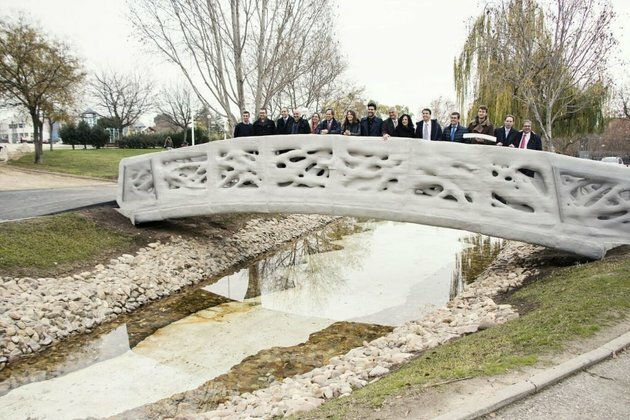 Wrong, because right now in Madrid people are walking across a human-sized bridge that was 3D printed on an industrial scale. The bridge in question, which features tree branch designs along the span, was printed by the Institute for Advanced Architecture of Catalonia using micro reinforced concrete. If you take a closer look at the images, you can see the 'grain' line, where the industrial concrete printer created layer after layer to build up the bridge, just like the Dremel 3D printer we tested last year did with all the silly items we made. Go to Madrid, and you can walk over it yourself. We're not saying get one of those concrete printers to Mars to make us habitats before the astronauts arrive, but we are definitely shouting it.